What’s the easiest summer outfit? 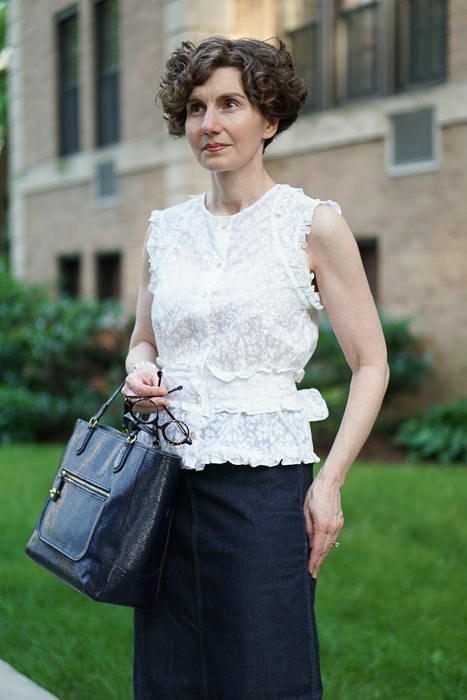 A denim skirt and a white blouse, bien sur. The Photographer just told me to stand up straight. I aM StANdinG UP sTRaiGHt! Here is more up-straight standing. Note: When I first showed you these sandals, I said that the platforms were wrapped in white leather. I was wrong. The platforms are not textile-covered. I’m looking at them and touching them, and I don’t know what they are made of. Plaster of Paris? Generic, non-specific SuBStAnCE? Whatever it is, it’s light as a feather. 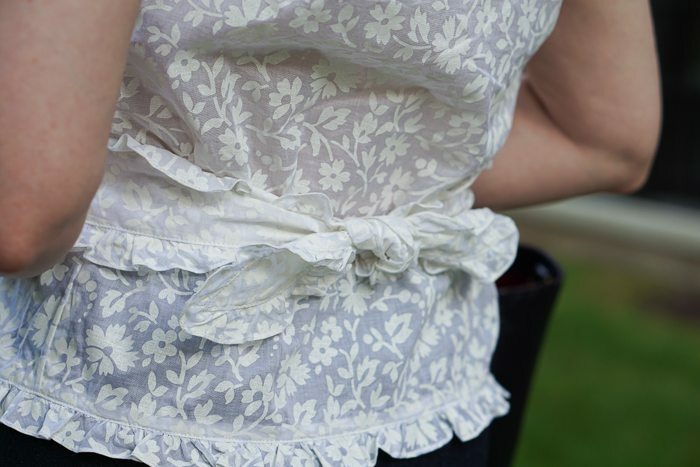 This blouse is old, and therefore shown purely for illustrative purposes. As much as I love white blouses, I rarely will pay full-price for one, because they are so easily (predictably) ruined. Deodorant, chocolate, coffee, sunscreen. Say what you will about diet soda; Coke never ruined anything of mine. Now is a good time to be looking for a great blouse on sale. 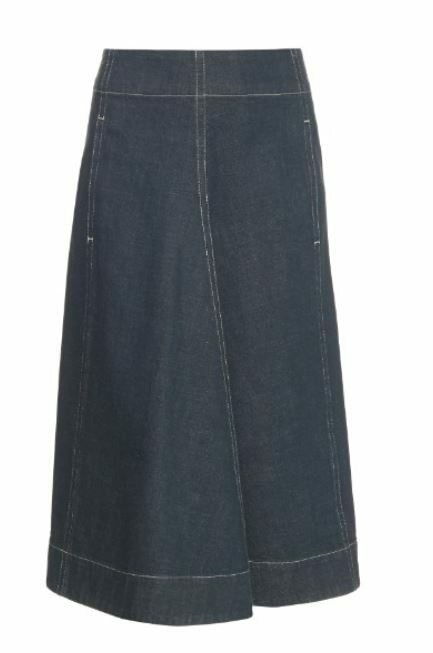 And here are some charming denim skirts, also on sale. Your blouse is exquisite! If you are interested in non-staining deodorant, my experience of the mineral salt ones (that are just a block of salt that must be wetted to be applied) is spotless in that regard (as well as being highly satisfactory otherwise). Jessica, I have a feeling that your comment may be a watershed in my life, dividing it neatly into “Before” and “After.” Must investigate mineral salt deodorant. I love love love your blouse. Thank you for the bonus Directrice post this week! I love your captions so. 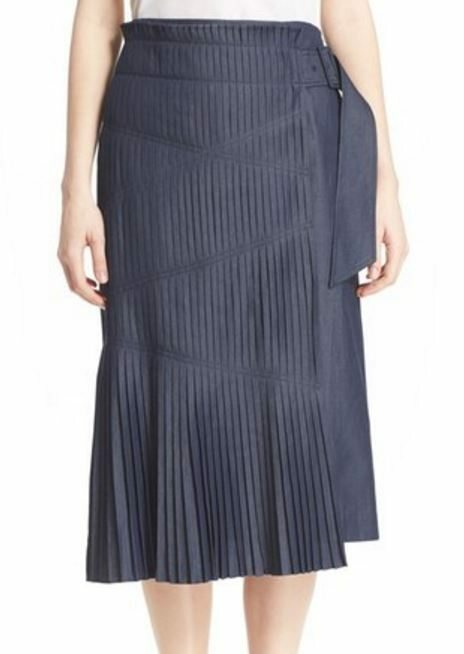 Denim skirt! Precious. 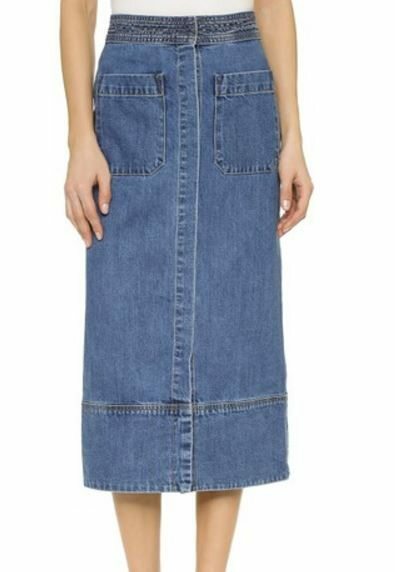 My last denim skirt was acid-washed (and was in the ’80s). This is a great combo.